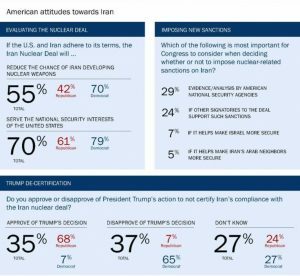 Even among Republicans, a significant majority believe the nuclear deal is good for our security, despite the President consistently trashing the accord that prevents Iran from becoming a nuclear weapons state. The President and senior Administration officials like Secretary of State Rex Tillerson and Ambassador to the United Nations Nikki Haley have claimed that the nuclear deal is insufficient because it did not address other Iranian behaviors like ballistic missiles and Iran’s relationship with Hezbollah. As concerning as those activities are, however, withdrawing from the nuclear deal is not, as they argue, an opportunity to start over and get more concessions from Iran, but rather a massive slamming of the door on the diplomacy that would make better outcomes in the region possible. The American people support diplomacy because the alternative is likely a war. Do we trust that Iran is a good actor thanks to this deal? No. But we know that the negotiation of the JCPOA guaranteed an inspection and verification regime that keeps their nuclear activities under surveillance, and we know that withdrawing from the deal undermines those capabilities. If we lose the JCPOA, we lose the assurance it provides, and a military option becomes more likely. Rational Americans do not want to go to war with Iran. The results of this poll are consistent with other recent efforts to measure American support for the deal (including this Morning Consult poll) and illustrate an important fact: most Americans do not share the President’s cavalier and irresponsible view of international agreements and diplomacy. Most Americans feel safer knowing that Iran’s pathways to a nuclear weapon are blocked. Most Americans would prefer to avoid a nuclear crisis in the Middle East when we are already facing the reality of North Korea’s nuclear capabilities. The American people and our allies around the world have all chosen the Iran deal over the alternative. If President Trump chooses to tear it up, he must do so knowing that he is endangering his constituents against their will and casting uncertainty over alliances and global security.